Houghton Mifflin Harcourt, 9780547391175, 256pp. Depicting the men of Alpha Company—Jimmy Cross, Henry Dobbins, Rat Kiley, Mitchell Sanders, Norman Bowker, Kiowa, and the character Tim O’Brien, who survived his tour in Vietnam to become a father and writer at the age of forty-three—the stories in The Things They Carried opened our eyes to the nature of war in a way we will never forget. It is taught everywhere, from high school classrooms to graduate seminars in creative writing, and in the decades since its publication it has never failed to challenge our perceptions of fact and fiction, war and peace, and courage, longing, and fear. 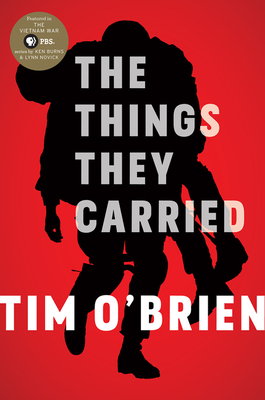 The narrator of The Things They Carried goes by the same name as the author, but the title page notes that this is a “work of fiction.” How did this launch your reading of the book? In the title story, soldiers carry things both tangible and intangible. Which were heavier? Which items spoke most powerfully to you? What do you carry around with you every day, materially and emotionally? What do soldiers carry in war today, and what would you most want to carry in war? Why is the first story told in the third person? What effect does it have on you as a reader to then switch to the first person in “Love”? O’Brien also uses the second person in this collection. For example, in “On the Rainy River,” the narrator, trying to decide whether to accept the draft or become a draft dodger, asks: “What would you do?” (page 56). Why does the author use these different perspectives? Who is Elroy Bendahl, and why is he “the hero of [the narrator’s] life” (page 48)? Discuss the two very short stories “Enemies” and “Friends.” What is the relationship between Lee Strunk and Dave Jensen? How are they both enemies and friends? In what other ways are the soldiers in this platoon sometimes fighting one another instead of the “real” enemy? In “How to Tell a True War Story,” O’Brien writes: “A true war story is never moral.” What does this mean? Is there even such a thing as a true war story? Can one person’s truth be another person’s falsehood? Can truth evolve over time, or is truth fixed and absolute? Can some truths stand in opposition and contradiction to one another? Is truth a simple matter of black and white, or can it come in shades of gray? In what other places in the book do we see characters struggling with morality? Are there morals to be learned from these war stories? How does the book change the way you understand the political ramifications of Vietnam? How does its discussion of morality fit into the larger discussion of wars and our world today? Consider the many paradoxes of war and how O’Brien brings them to light: “I was a coward. I went to war” (page 61); “The truths are contradictory. It can be argued, for instance, that war is grotesque. But in truth war is also beauty” (page 80). What are some other paradoxes of war? How do they affect your understanding of war? At the end of “How to Tell a True War Story,” O’Brien claims the story he’s just related “wasn’t a war story. It was a love story” (page 85). How does O’Brien distinguish between a war story and a love story? “A true war story, if truly told, makes the stomach believe” (page 78). Which stories in this collection made your stomach believe? Which felt true? Is it essential to you that a story be rooted in fact? If so, what do you make of Thumbelina, Alice in Wonderland, or the stories of Edgar Allan Poe? The soldiers often tell jokes to relieve tension. Did you find their jokes funny? How is language important to the soldiers? What words do they use to make their experience easier to handle? What other tricks do the soldiers use to keep themselves sane? What are some of the tools O’Brien uses as a writer to make the reader feel the immediacy and reality of the war? How does he work with tension? Many of the stories are told second- or even third-hand (“Sweetheart of the Song Tra Bong”; what happened to Rat Kiley in “Night Life”). How does this color our understanding of the stories? Why does O’Brien create this distance? Three stories in succession, “Speaking of Courage,” “Notes,” and “In the Field,” deal with one event: Kiowa’s death. O’Brien similarly shows us incidents from different perspectives throughout the book. Where else does this device occur? How do these different perspectives change your understanding of an incident? Why do you think the author chose to do this? In some of the stories, O’Brien pauses to address issues of storytelling: “The sound. You need to get a consistent sound, like slow or fast, funny or sad. All these digressions, they just screw up you story’s sound. Stick to what happened” (page 107). What effect does this have on your reading? What does the book teach us about writing? Repetition is a device O’Brien uses in his stories. What do you remember about the man killed by the narrator? How does the repetition of the same language enhance the event or affect your understanding of it? In “The Lives of the Dead,” O’Brien writes, “Stories can save us” (page 225). How do stories save the narrator? What else can stories do, according to The Things They Carried and from what you’ve experienced in your own life? The story “Good Form” attempts to explain the method behind the construction of the book and raises the questions What are stories for? How might Tim O’Brien answer that? And how would you? There are many different types of loss addressed throughout the book: the loss of life, of course, but also the loss of the past—for example, after Tim O’Brien gets shot for the second time, he feels the loss of being a “real” soldier very strongly and misses the excitement and fraternity of combat. What else do O’Brien and the other characters in the book lose? What does resurrecting these losses through story accomplish? What losses do you feel most strongly in your own life, and how do you deal with them? Do you tell about them?